Love is not only about joy and happiness, sometimes it is about longing and separation. Tell your loved one in the romantic form that your heart belongs to boyfriend and express how much you want to meet. These messages below will help you to become even closer, even if you are separated by thousands of kilometers. Distance can be quite a harsh trial for any couple. Don’t let the miles that separate you and your beloved ruin your relationships. Keep saying how much you love them, miss them and dream of meeting them as soon as possible. My sweet, for you I am ready to fight with the whole world and go 9 circles of hell described by Dante in order to see you in the morning and to enjoy your tenderness and care. Without you there is no me, without your love there is no warmth in my life, you have opened Eden for me, in which I want to plunge. I miss you. Today the sun shines especially brightly and the wind brings to you the fragrance of your favorite flowers, listen to the bird songs, they talk about how much I miss you. There are tons of reasons why a couple may face parting either short-term or long one. Yet whatever the reason is, hope for the best, keep waiting for a reunion. And while you are waiting, let your boyfriend know how endlessly you miss him. Even the most starry night is empty and dark for me because you are not by my side. I miss you a lot. My heart is bleeding, only you can heal me with your kisses and hugs! I miss you, come to me ASAP. Even in the most wonderful weather, I’m suffocating without you. Save me, my love. I feel miserable without you, boy, I am addicted to you and it is the most pleasant dependence in the world. A day spent without you, is the day, lived in vain, come back soon, my love, do not let me waste my life. My beautiful, beloved, gentle, understanding woman, I miss you terribly and count hours until our meeting. The universe gave you to me, and I promised to love you, protect, appreciate and take care of you. So I cannot live without you no more than one day, I really miss you, my love. Today I am extremely lucky – I have met this wonderful morning together with you, but tomorrow I will be the most miserable person on Earth because you won’t be with me. I miss you, my sweet. When I’m with you, my world explodes with thousands of colors and a rainbow decorates the sky, when I’m without you, my life plunges into darkness. Please, be with me as often as possible, and illuminate my life with your light. I see you in the passers-by, a tinkle reminds me of your laughter, every phone call for me – is the hope to hear your voice. I miss you terribly and I cannot and do not want to be without you. 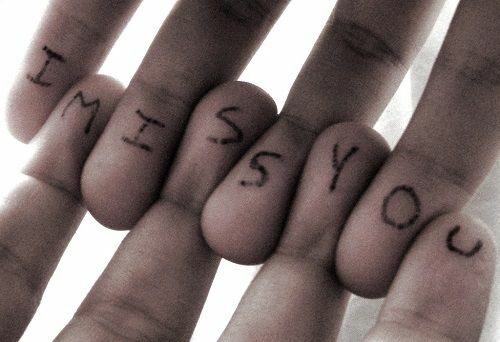 I miss you terribly, even now you are far away, but you’re always in my heart and it helps me to bear our separation. My love for you is eternal. My life with you reminds of a beautiful dream and I’m ready to do anything so it could last continuously. I miss you, my love. Your eyes are boundless, I look at them and I do not feel the bottom, and I melt in your warm hands. I miss you, come back soon and give me happiness. Bliss for me means to feel the happiest woman next to the best man in the world. Thank you for sharing your life with me! Love you, miss you. This morning I looked in the mirror, I noticed that something had changed in me. You left and I lost shine in my eyes, which only you can give. I love you and I miss you, come back soon. My heart is torn apart because you’re not with me. My man, my hero, my life, I feel so bad without you, come back soon. You’re at work, it is raining outside and I sit and look at the flame in the fireplace, but it won’t warm me like your kisses! I am waiting for you and I miss you. When I feel depressed and nothing pleases me, only you raise me up and make me smile. I love you madly. Your love is a heavenly gift which I was lucky enough to get because your love has changed me and the world around me became brighter. I miss you, my sweetheart. Darling, I have a problem: there is a hole in my heart, and only your kisses, hugs, and sweet words can heal me. I need you, darling. When you miss somebody, there’s this void inside you that seems to be impossible to be filled. We all feel this way every now and then. But you know what? Maybe you should not go on trying to fill it. On the contrary, open up about the feelings and tell a person you miss about it. My soul seeks you like a butterfly flies to fire, you attract me like a magnet and my dearest wish is to be forever in your sweet captivity. I really miss you, my darling. You are the most romantic man in the world and I’m really happy to be the one, who shares with you all the hardships and joys of life, I want to be with you always, everywhere and forever. With you, I have met my youth, experienced the joys of adolescence, and I can confidently say that you are the man, with whom I want to meet the sunset of my life. I miss you and I am sending you my kisses. Darling, our love has stood the test of time and the distance that separates us today won’t interfere with our love. I will always remain a loyal and faithful woman to you, I miss you and I anxiously wait for our meeting. For some people, the joy is dear and close people near, traveling, work and material prosperity, and for the boundless joy, I need only your smile. Come back faster and make me immensely happy. Longing for you obscures the whole horizon, all the stars have faded and the sun doesn’t warm me. Darling, dispel faster all the clouds with your love. I miss you. When there’s the true love between you, being separated breaks your heart yet keeps it beating faster every time you think of your dear boyfriend. Our point is, parting teaches us to appreciate our loved ones more. If you ask me: what is more important for me – to breathe or to love you, I’ll answer that I am ready to love you until my last breath. I miss you, my best man. Honey, today I was thinking about what will remain in this world after us, and I realized that everything could change except our love, our love will be reflected in our descendants. I love you very much and miss you. Only you will be able to ease my emotional pain, your eyes look into the heart and fascinate me. I am yours forever. It is awful to love you without having an opportunity to touch you. You’re far away and I cannot think of anything else as our last meeting. I miss you and I wait for you with impatience. Every second without you hurts my heart, which is covered with scratches because we are often apart. Heal me with your love, be with me. One day without you for me is a hundred years without happiness, you are the source of my inspiration and felicity, I miss you. For each day of our separation I demand from you a compensation, the first gift from you will be a million of kisses, so get ready, darling! In order to exist I need water, air, and food, but in order to live, I need you. Come back soon, I love you very much. Even the most beautiful day will become a nightmare for me if I spend it without you. I miss you and I am sending you my tender kisses. My boy, I sorely miss you, I need to see you at least a few times a day every day for the rest of my life. It is a pity that I cannot change hands of a clock so that to hasten the day of our meeting. I’m madly in love with you and I miss you. You are my sun, and if I were a planet, I would stop spinning, and would look at your beauty and admire you. I really miss you, my favorite. There are many things that I can do in this world, except one thing – to be away from you. I love you and miss you terribly. Today I am very unhappy because my happiness – is you and when you’re not around, nothing and no one makes me happy. Come back faster, I am missing you. You and I are the pieces of one whole, and when you leave, I feel incomplete, my heart strives for you. Miss you. 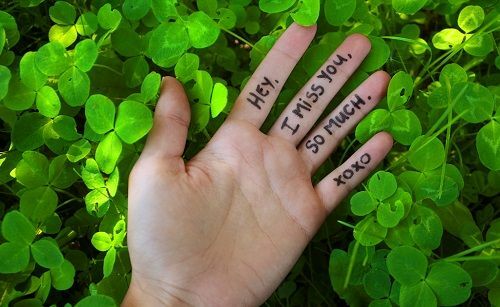 Darling, I miss you every day 86,400 seconds and you’re always in my thoughts! I’ve never missed anyone so much, I love you and I believe that we will always be together. My heart beats only for you, and my main goal is to devote my life to you and to become the mother of our children, I really miss you, come back to me and stay with me forever. Darling, do not break my heart, I need your love to breathe and your kisses to enjoy this life. Longing for you fills my heart, I love you very much. The whole world is empty without you, I can live without food and water, but without you, I cannot live a single day. Come back soon. When writing the I-miss-you message, don’t forget about all that cute stuff you said to him when the two of you were next to each other. This will evoke his sweet memories and warm feelings. Today, such a beautiful day, spring fills with warmth my soul and love is in the air, I wish you were with me now. I really miss you and love you very much. The worst thing in the world for me is to think about your perfect eyes and do not have an opportunity to look at them, to think about your gentle hands and not to be able to feel their warmth, I am missing you. Come ASAP. Hello! Darling, I just wanted to remind you that there is a person in this world, whose world is you, this man really misses you and wants to see, it’s me! Even the moon does not miss the stars more than I miss you, you’re awesome, I melt in your hugs. My favorite day of the week is the one, that I spend with you, so this week was very sad and uninteresting! I hope that we will make up leeway, come back soon, I miss you! With you, I feel great and I’m not afraid of anything except one thing – I am afraid of being alone. You became everything to me, and even more. Miss, kiss you, my beloved! Alert! The person, who is reading this message, gets a consolation gift – a million of kisses from me! Do not be sad, we’ll meet soon, I miss you. Only with you I can share all the joys and sorrows of my life, you are my friend, partner, my favorite woman, who always calms and supports me. I adore you and miss you. Every day without you is a scar on my heart, have mercy, come back soon, I cannot live without you. Kisses. Destiny has presented to you to me, and immediately took you away, but I will never let my happiness go. I’m waiting for you with impatience and counting the days until our meeting. I love you. Let this parting be the longest in our life and the greatest grief in our relationship. I miss you, I will always wait for you no matter what. 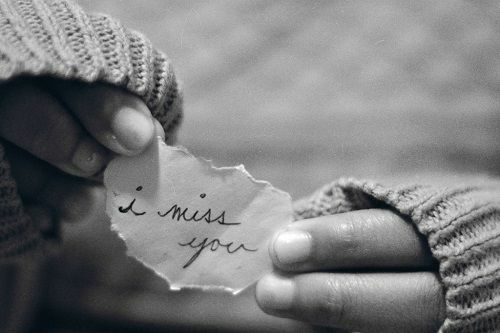 Sometimes even a simple phrase like, “I miss you babe” can tell more about how you feel than a million of other words. Trust us, this is exactly what your boyfriend wants to know, because he surely feels the same way about you. Darling, you left and took my heart with you, come back soon, because I cannot live! Love. I’ve always thought that the most difficult thing is to smile through tears, but now the hardest thing for me is to miss you, my heart is torn apart! Come back soon, I miss you. In my life now there is an acute shortage of love, happiness, and laughter, only you can help me! When will you come? We’re not together and the memories of our last date help me not to be sad, I think of you constantly and miss you. My love, our separation is not eternal, remember that every cloud has a silver lining. I love you, soon we will be together. Today the sky is very stellar, and do you know why? Because each star is my compliment to you and a declaration of love. I love you and I miss you. Every drop of rain is my tear, my heart weeps with longing for you. I love you madly, come back soon, I miss you! My sweet, I know that our meeting with you is worth any expectations, I adore you and I wait for you! I could never imagine that the other person will totally dominate in my heart and my soul. You won me over, I cannot wait for our meeting! Miss you, love you. I cannot fall sleep without you, I’m very fond of you, and my best habit, acquired for all time, is to kiss you every morning. Come back soon, I love you! You’re more important to me than the sun for flowers and water for fish, you are the meaning of my life. I miss you and I dream of our meeting. Let me distract you for a moment and tell you that I miss you and love you! I’m waiting for you in the evening, kiss you! I can’t stop thinking about you, you are my most excellent obsession, I need you for a lifetime! My sweetheart, I’m crazy about you, I miss U. Even if I do not tell you about it often, but my heart needs you 24 hours a day! Get back soon, I miss you terribly. I realized the insignificance of material goods of this world after I have met you, if I could, I would give all that I have, for the sake of seeing you at least for five minutes. I really miss you, baby.